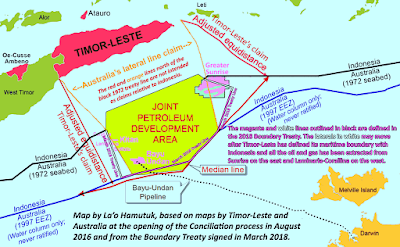 On 6 March, Timor-Leste and Australia signed a Treaty to finally establish their maritime boundary, which is pending ratification by both countries. La'o Hamutuk made a submission to Australia's Parliament in April. We appreciate both nations’ success in defining our maritime boundary, after decades of struggle and frustration. We encourage Timor-Leste and Australia to ratify the Treaty expeditiously. Timor-Leste should maintain its effective, transparent system for managing petroleum activities. Our nation needs to focus its energy and resources on diversifying our economy away from petroleum dependency. Before spending more money on the Tasi Mane project, the Government, Parliament and the public should study a rigorous and objective assessment of its fiscal, social, economic and environmental costs, benefits and risks. For more information on this complex and critical issue, see La'o Hamutuk's website.